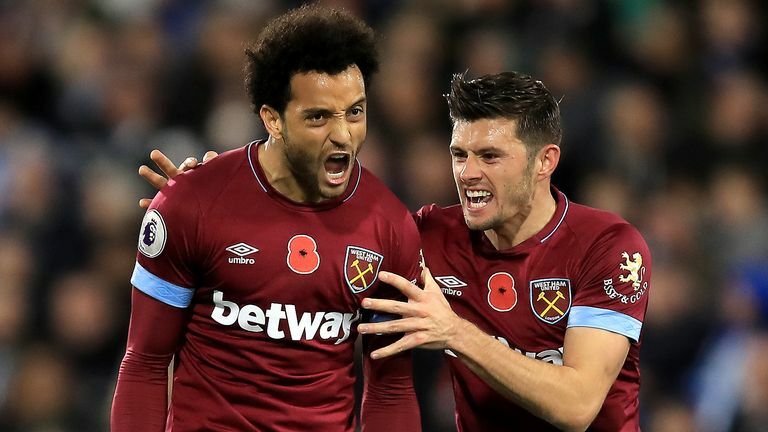 Felipe Anderson struck late on to secure a hard-earned point for West Ham against Huddersfield at the John Smith's Stadium. Huddersfield enjoyed the perfect start when Alex Pritchard became their first player to score a home goal this season with a well-taken effort after six minutes. However, Anderson drew the visitors level with 16 minutes remaining when he smashed a left-footed shot into the roof of the net following a goalmouth scramble. The result means that Huddersfield remain in the relegation zone while West Ham stay13th after failing to capitalise on Brighton's slip-up against Cardiff. Fresh from their morale-boosting first win of the season against Fulham on Monday night, Huddersfield started the game in confident mood and only a combination of Lukasz Fabianski's fingertips and the crossbar denied Steve Mounie's header flying in with three minutes gone. Just a minute later West Ham had a fantastic opportunity of their own when Marko Arnautovic found himself in acres of space inside the Huddersfield half after being picked out by Grady Diangana but his low strike was diverted past the post by an onrushing Jonas Lossl. Huddersfield fans have had to wait a long time to see one of their own players score a goal at the John Smith's stadium, 726 minutes to be precise, but they finally had a goal to cheer about when Pritchard capitalised on some sloppy defensive play by West Ham to fire beyond Fabianski from the edge of the box. Huddersfield's David Wagner says once they get luck going their way they'll gain more points. The hosts nearly doubled their advantage on the quarter hour mark when Phillip Billing's intended cross from the left wing sailed over Fabianski's head and thundered off the inside of the far post, but they were dealt a blow just before half-time when Chris Lowe had to be replaced after suffering a shoulder injury. Both David Wagner and Manuel Pellegrini named unchanged teams after seeing their teams win last weekend. Huddersfield were much the better side in the first half and Manuel Pellegrini made a change at the break to stem the tide with Javier Hernandez introduced for Diangana. The Mexican international almost made an immediate impact just after the restart when his shot was blocked by Lossl before he headed the rebound onto the roof of the net. Eventually, West Ham did draw level through Anderson's third goal in two games. 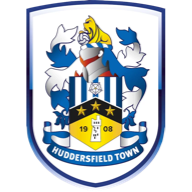 There was an almighty scramble inside the Huddersfield area with Hernandez and another substitute Michail Antonio both denied by blocks before the loose ball dropped to Anderson who fired a shot into the top corner beyond four Huddersfield defenders on the line. Moments later, West Ham were inches away from taking the lead as Issa Diop's thunderous header was brilliantly cleared off the line before Laurent Depoitre almost snatched a win for the hosts in the dying minutes of injury time when he somehow failed to get a touch on an Isaac Mbenza cross into the box. Huddersfield haven't scored more than once in any of their last 22 Premier League games, netting just nine goals in total in that run. Six of West Ham's seven Premier League goals against Huddersfield have been scored in the second half of games. West Ham have kept just one clean sheet in their last 15 Premier League away games, a 2-0 win at Leicester in May. Alex Pritchard is the first Huddersfield player to score at home in the Premier League in 726 minutes of action, since Tom Ince scored against Watford back in April. Huddersfield's Jonathan Hogg registered his first league assist in 112 appearances, since setting up goals for Huddersfield against Bolton in the Championship in December 2014. Alex Pritchard had managed just one goal and one assist from 32 Premier League games for Huddersfield prior to the game, but he registered his first strike of the season to hand his side a deserved early lead. Goals remain an issue for Huddersfield but Pritchard's partnership with Steve Mounie, which generally saw him buzzing after the target man's flick ons, showed plenty of signs of promise. David Wagner: "It was a good game, both sides wanted to win, both sides wanted to create offensive situations. I think in the first half, we were the team with more clear-cut chances, we deserved the lead for sure and it was a great goal from Pritchard. 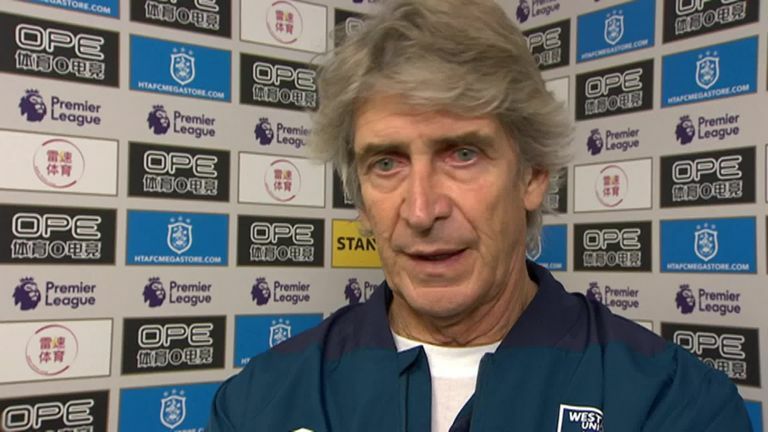 Manuel Pellegrini reflects on West Ham's 1-1 draw with Huddersfield as Felipe Anderson scores a late equaliser. "We had further opportunities with Mounie's one-on-one, we hit the inside of the post, hit the bar from Mounie, we had a penalty incident which I think was a clear pen when Zanka was fouled from the corner. Unfortunately, it was a game where we didn't have the luck to score more than one goal." Manuel Pellegrini: "I'm happy because we didn't play well. 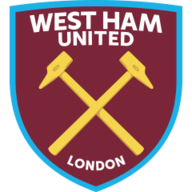 Maybe before the game the media and a lot of people thought [West ham would beat] Huddersfield because they have only won one game, but I said before that in the Premier League there are no easy games, every team plays with intensity. "Liverpool came here and won just 1-0. Today we found a team that we've prepared to play all week, every cross, every shot and every second ball is dangerous and in that sense they did it better than us. In the second half we improved and created some chances but not enough to win the game." Huddersfield's next game after the international break will be a Super Sunday clash against Wolves at Molineux, live on Sky Sports. West Ham host Manchester City at the London Stadium in their next game in a fortnight's time.